In honor of fashion week, I thought I'd share with you some high fashion Charlotte has been rockin'. Although she might not be runway ready yet, she sure is getting in lots of practice! When Girls Crochet Headbands (GCH) contacted me to review some of their items, I jumped at the opportunity. I was already a loyal customer and familiar with their products so this would be easy! GCH offers boutique style clothing and accessories at a fraction of the cost. When I found out we were having a girl, bows, headbands and ruffles danced in my head. If you already know me, you know I love to wear bows (yes, I'm aware I'm an adult). But my bows have all have clips on them and in order to share them with my little girl, I needed to find a way to use them on an infant. After a quick Google search, I found GCH and their awesome crochet headbands. What was even more awesome was the price. At a mere $.29 a piece, I could afford to get them in every color! So even though Charlotte doesn't have a ton of hair, that doesn't stop her from rocking the big boutique hair bows. I can't stress enough the amazing price of everything at GCH. Look at all the stuff I got for just $50! If you went on Etsy, you would spend well over $100 for everything I got. Charlotte can't wear the tutu's just yet, but I'm sure by the time she is 6 months, she will be a tutu wearing queen. And at just $4.49 a piece, you can't beat it! 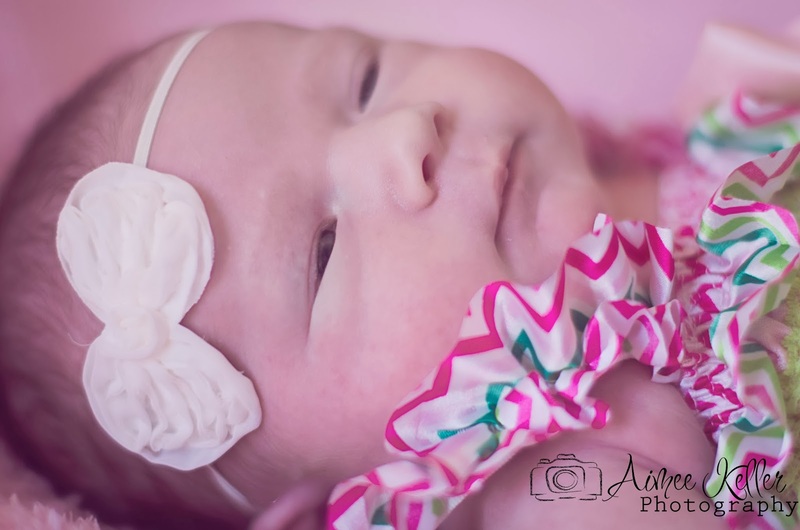 Check out this adorable shabby chic headband. It goes with everything and I can't wait to get it in a few more colors. I mean seriously, how perfect is this?! One of my favorite things I got was the ruffle romper. 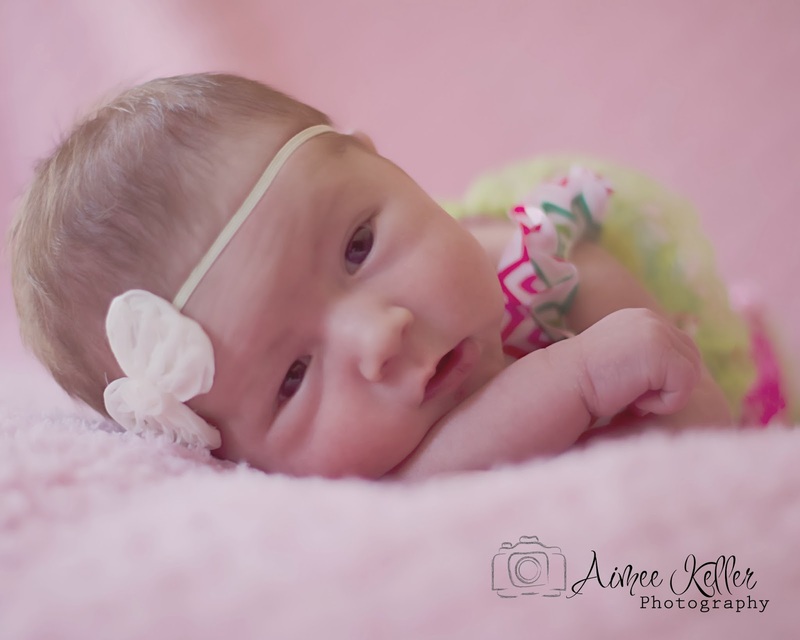 You may recognize it from her newborn pictures. I was skeptical at first when it said a small would fit babies from 0-9 months. I figured she wouldn't' fit it until closer to 6 months. But I was wrong! It has enough stretch in it that she can wear it now and will be able to wear it later as well. This one came with super cute leggings and I can't wait for her to be able to wear them (probably this summer). They also have a Minnie Mouse inspired one that I got previously and I can't wait for her to wear it on her first trip to Disney. Let's not forget the adorable leg warmers I got. Charlotte has already rocked her football ones for the Super Bowl. She also has the pink hearts to wear for Valentine's day. What I like about these is that she can wear them now and through her toddler years . So, if you haven't already, go to the GCH website to see all the adorable clothes and accessories. They are constantly adding and refreshing their inventory which makes you keep coming back for more. To keep up with all the fashion trends and the new items GCH is offering, be sure to follow their blog. They also use their blog to announce monthly photo contests. If you submit a photo of your little one wearing GCH gear, you could win credit to their store! 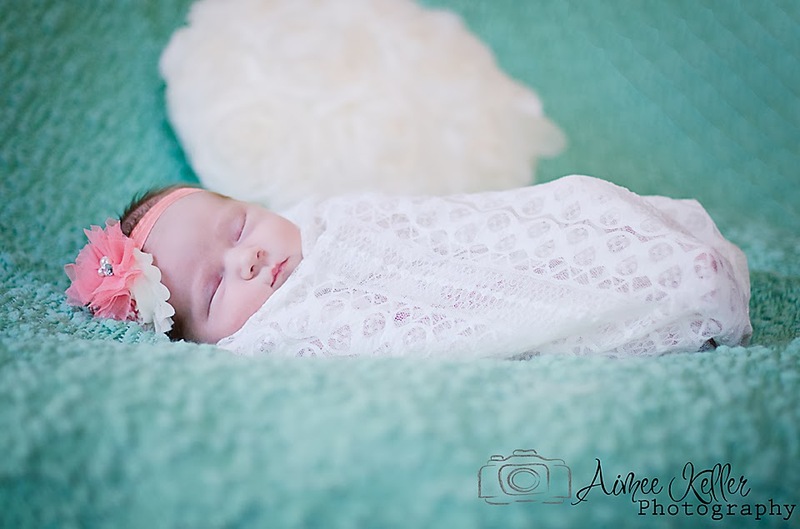 I'm so excited to finally share Charlotte's newborn photo shoot with you! 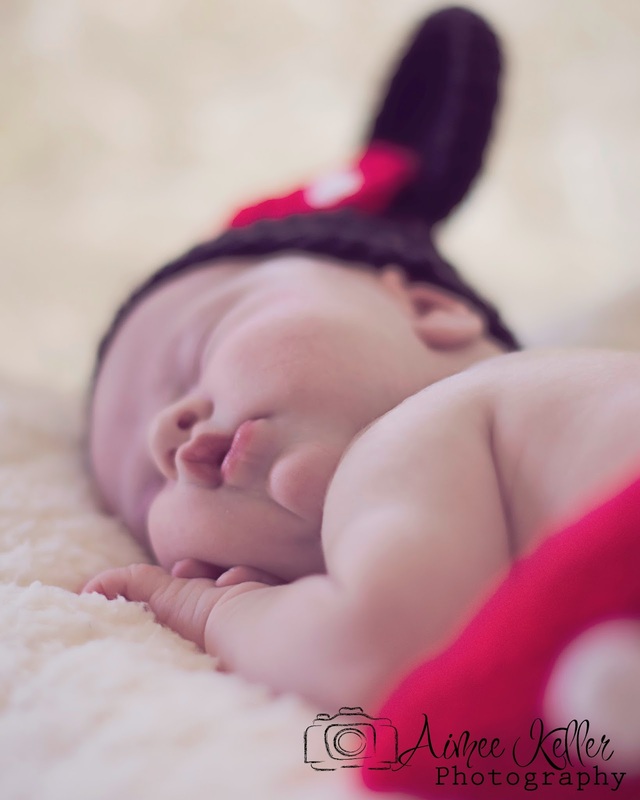 We had planned this newborn session well before she was even born so you can only imagine my excitement when the day came. Professional photo shoots are very popular right now and after experiencing one, I can see why. We did the shoot at the photographer, Aimee's house since she has a studio and all the props right there ready to go. All we had to worry about was bringing Charlotte and any special outfits we wanted her photographed in which made for a stress free photo shoot. 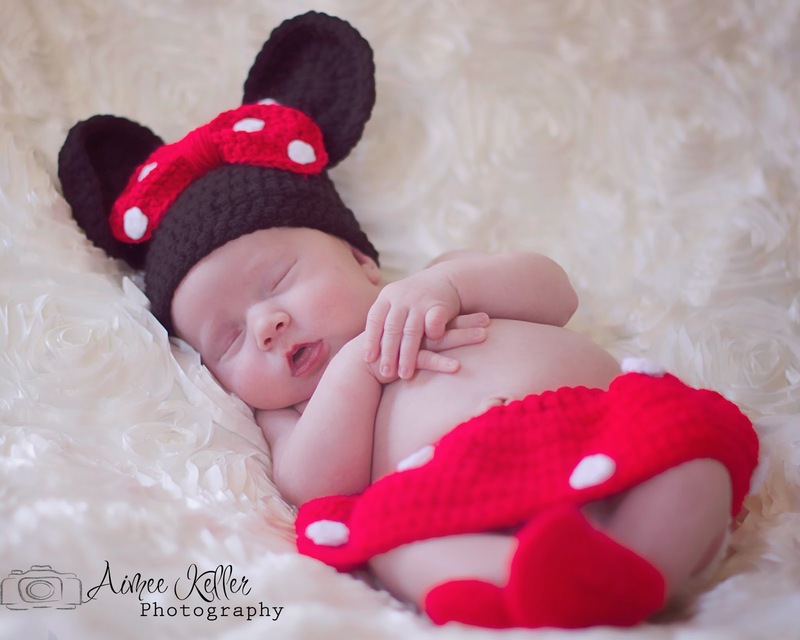 Of course, I had a few outfits in mind like her Minnie Mouse crochet outfit and her adorable ruffled romper. The rest was part of Aimee's collection. 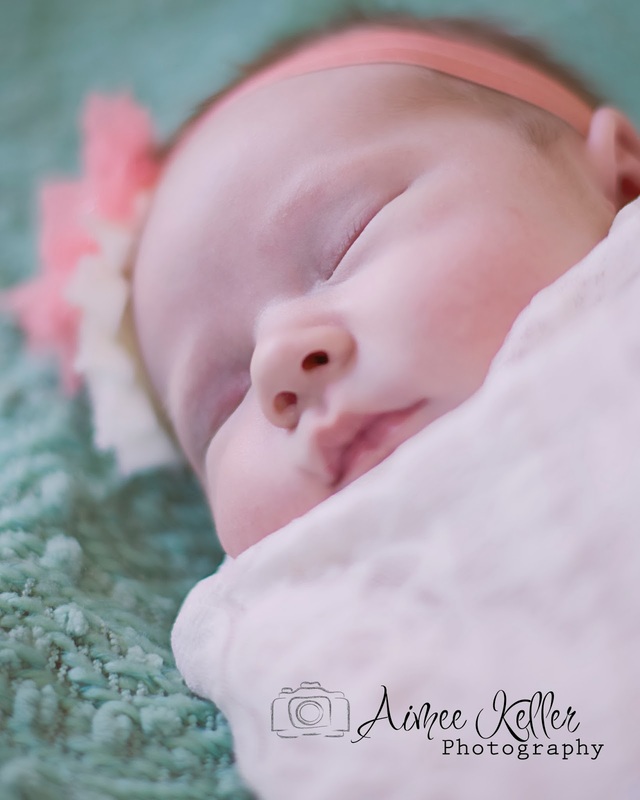 Not only did Aimee get some great shots of Charlotte, but I had no idea what goes in to making a newborn cooperate for a photo shoot. She knew exactly what to do! There was lots of snuggling, pacifiers and of course lots of patience. She also asked in advance for me to have a bottle ready in case of a meltdown. it was a good thing we did that because within the 30 minutes of the shoot, Charlotte demanded a bottle. After that, things went pretty smooth, with the help of Aimee of course! Look how content she looks! Look at this adorable collage she made for us! 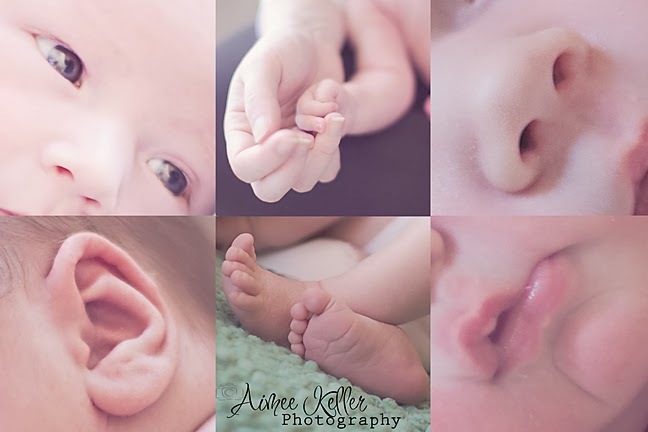 I love her idea of capturing all those little baby features that will soon not be so little. She can also design a Facebook cover photo and birth announcements! 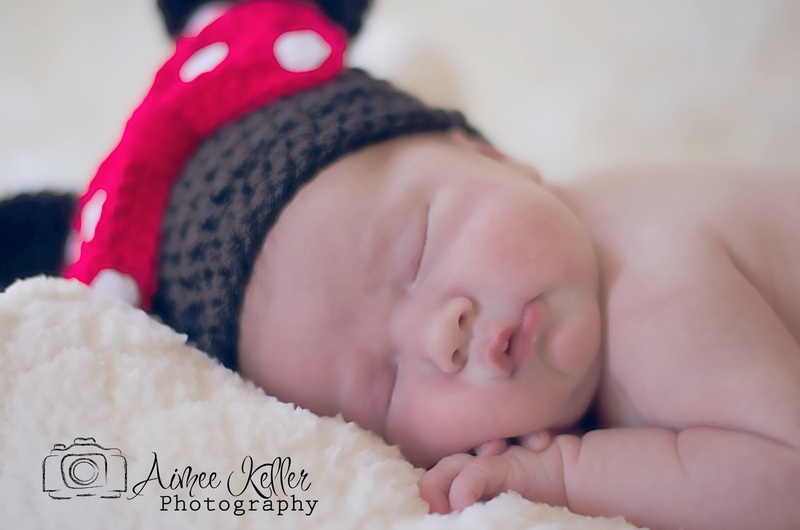 So if your in the Northern Virginia area, be sure to check out Aimee Keller Photography! Like every mom out there, I can't believe how fast time is going by. It feels like we brought Charlotte home last week but she's already a month old! I love watching her change and grow every week. Even the littlest of milestones are exciting. Eating - Charlotte isn't the most consistent baby. She loves food, but how much and how often is up to her. She usually eats three to four ounces but sometimes will only take two. We try to feed her essentially an ounce an hour. So if she eats three ounces, we expect to feed her in three hours. That doesn't always work and sometimes she wants to eat every two hours. It can be frustrating not always knowing when she'll want to eat next, but as long as we are prepared with bottles, it's not really a problem. Sleeping - Like most babies, Charlotte likes her sleep. Although, she seems to be awake more and more the older she gets. I love how alert she is and all the sweet noises she makes, but it's nice when she sleeps too. There have been days when she'll only sleep for 15 minutes at a time which makes for an exhausting day. But I'm learning that taking her out to run errands helps to get her to sleep during the day. We've also learned that the louder it is, the sounder she'll sleep. We took her to a friends house to watch the Super Bowl and she didn't wake up during the five hours we were there, not even to eat! Some nights are better than others, but for the most part she only wakes up to eat which is usually about every 3 hours. She sleeps in our room in her rock-n-play which seems to work our well since it elevates her a little and vibrates. If she gets fussy, I can reach out and rock her back to sleep. We really can't complain, we have a good sleeper....for now! Couldn't resist sharing this awesome picture of her giving Minnie the stink eye. Likes and Dislikes - Charlotte likes being wrapped in a blanket and warm at all times. She hates waiting for a bottle and the constant gas pains that are associated with eating (thank goodness for gripe water and gentle ease formula). She loves being held as much as possible and uses her Wubanub as a way to self soothe. Linking up with Molly @ Still Being Molly for Funday Monday! I have to admit, Fridays aren't as exciting when you're home all day every day. I still look forward to the weekend though, just for different reasons. Instead of celebrating the end of a work week and the start of a lazy weekend, I can't wait to spend time with my husband and be able to split baby duty! It's the little things. Milo is definitely getting less attention these days, but he's handling it quite well. So far he hasn't really acted out or done anything out of the ordinary. When we do get the chance to snuggle him, he loves it. For Christmas my sister got me a 6 month subscription to Casetagram. I love it! Every month I get to choose my pictures and design my own case. Even though the Super Bowl was boring, Charlotte still wanted to show her football spirit. I couldn't help but put this outfit together. Probably my favorite so far. We are all getting used to this whole bath time thing. I'm learning to be prepared so she stays happy (no baby likes to be cold and wet). I couldn't help but snap this picture of her completely content after her bath. If you follow me on Instagram, you've probably already seen this picture. I felt like I finally got a hold of this whole mom thing for a minute and was able to multi-task to get a few chores done all while enjoying a glass of wine with a happy baby. Another successful week here at home and now that Charlotte is almost a month old, time actually feels like it's flying by so quick. I know everyone says that, but it's so true! A little less than a month ago, my life changed forever. I became a parent and thus a new chapter in my book of life began. So I decided to start a new chapter here by freshening up my blog design. Now that I'm a mom (eww that makes me sound so old), I wanted to go for a cleaner, more grown up look. What do you think?! Before you start thinking I'm a talented website designer, let me introduce you to the person behind my design! Kailyn has been one of my dearest blog friends and biggest supporters. See, we were paired together over a year ago as part of a "big/little" campaign. We instantly became friends through our mutual love for all things Disney. More importantly, since she is my "big", she has been my mentor. She has taught me everything I know. One of the best things Kailyn did for me was design my original blog template. She worked with me and transformed my poorly designed webpage (couldn't even call it a blog then) into the blog you know and love today. So when I decided it was time for a refresh/update, who better to turn to? When we started this process, the first thing she had me do was fill out a form to better explain what I was looking for. Based off my answers from that, she gave me a preliminary design. From there, we emailed back and forth and tweaked until it became what you see today; exactly what I wanted! I can't thank her enough for all the hard work she put into this (mainly in dealing with me and all my changes). Often times my ideas were extremely abstract and hard to put into words, but it was like she could read my mind! Kailyn gave me a finished product that was even better than what I had envisioned. If you are looking for someone who can design your blog whether you're new and are starting from scratch, or just want to update your current design, then Kailyn is the perfect person for the job! She will hold your hand every step of the way and give you an awesome end product! Be sure to check her out over at Kailyn Marie Designs! I always knew the infant carriers were heavy but not that heavy! I find it very difficult to be somewhat comfortable when toting my little one around. The easiest way to deal with the weight is to put the carrier in the nook of your arm, but after a day of that and a bruised arm later, I was on the hunt for a solution. My mom told me about a tutorial she saw for a padded arm rest, so to Pinterest I went. I found this tutorial and made my own. The only modification I made was to omit the ribbon part since I did not plan to hang toys from it. Below is my version of the handy dandy car seat arm saver! High Density Foam - 11"x 7"
Two pieces of fabric - 8.5" x 14"
The first thing I did was cut down the foam to the correct size: 11" x 7". The easiest way to cut through it is to mark your dimensions with a pen or marker and then use a serrated kitchen knife to saw through it. Now, set your foam aside and take your two pieces of 8.5" x 14" fabric and sew around both long ends and one short end with right sides together. Once you've done that, go ahead and press under the short side you didn't sew about half an inch all around. This just makes it easier later. Take your Velcro and attach it to the short side that you have already sewn. Be sure to sew all four sides of the Velcro. Then, to help reinforce it, you will want to do a straight stitch on one side of the Velcro as pictured above. I apologize for not having pictures of the next steps, but it's fairly easy. You will want to stuff (this part is challenging as it will be a tight fit) the foam into the bag you've already made. You will have to fold it down in half so you can work with the other short end. You need to sew the other piece of Velcro onto the open end just as you did before. Make sure you put this piece on the opposite side of the first piece (for example: I put my first piece of Velcro on the polka dot side and my second piece on the owl side). When you sew the Velcro on, you will also be sewing the bag shut. Now that the bag is sealed with Velcro on both sides, you need to unfold the foam from inside until it is flat as pictured above. And that's it! You just wrap it around that pesky car seat handle and you will have instant relief when toting your little one around town!